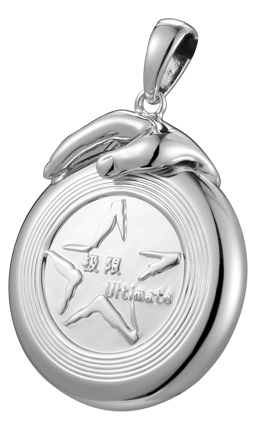 The 925 silver Ultimate Teamwork Pendant features a flying disc decorated with four Ultimate team player hands positioned to make a star shape. Amongst the hands, is the word Ultimate in both English and Chinese. The disc is gripped by the hand of an Ultimate player ready to throw a push pass.